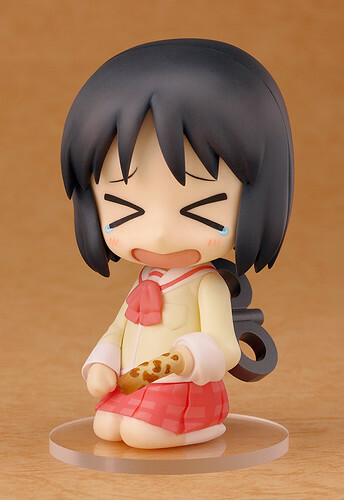 The adorable robot-girl from anime series Nichijou will be joining the Nendoroid realm soon. Yep, Nendoroid Shinonome Nano has been available for pre-order starting today. The unusual life of the Nichijou girls in Nendoroid form! From the popular anime that is now showing on NHK Educational TV, ‘Nichijou’ comes a Nendoroid of Nano Shinonome, the robot high-school student who lives in the Shinonome Laboratory. She comes with a load of extra parts to change her standard hands – a shark hand, a swiss cake, a chikuwa and even a machine gun. She also comes with three expressions, including a smiling face, a crying face and an exited face. Parts that allow her kneeling are also included, giving you even more options to recreate Nano’s very unusual everyday life! It’s the start of Rock ‘n’ Roll! She is scheduled for August release with a standard price tag of 3500 Yen. This entry was posted in News and tagged nendoroid, nichijou, shinonome nano. Pawnman, there have been numerous “facts” strewn about this article and forum. You have become a victim of your own statements. Mr. Cockburn is educated and can speak to the overall topic of Close Air Support. He can’t, nor be expected to, recite the JPub. His concern is well covered in the article, “Why is the country with the greatest air-power in the world sending less capable aircraft to conduct CAS missions”? We all know that per the JPUB definition of Close Air Support, any aircraft should be able to support it. However, as proven by you and other pro-Bone posts is not the case. Let me explain.